OGIDiscounts.com sets new standards in the relationship between consumers and merchants and also innovates the way that small or medium sized businesses promote themselves in the new economy. Would you like to enjoy discounts in your local stores? Discounts and Super Deals Daily in merchants and service providers near you, all around the World. Join our member's club and enjoy shopping with special Discounts. Everybody today uses applications in Smartphones. 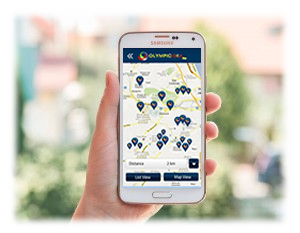 Get your business seen by everybody that uses our mobile app, in order to find Merchants that offer discounts in his local area. Everybody needs to shop. Remember the last time you went shopping. Was it two days ago? Maybe it was yesterday or a few hours ago. Whatever type of customer you are, OGIDiscounts.com will help you save on your daily shopping without changing your habits. OGIDiscounts.com offers a full package of online tools, called the OGIBiz tools, which help small or medium-sized businesses make their first steps in the e-world. We offer websites, e-shops, deals, free services and online promotion for a fraction of retail cost. We have developed a mobile app that helps our members easily track businesses that are registered with OGIDiscounts.com and offer discounts. Furthermore we have enhanced this application to provide ease of access to the most common functions of their daily activities.